Last night, as I browsed my phone before drifting to sleep, I came upon some news...news I never expected to hear the eve of opening night. 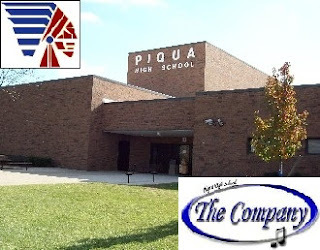 Richard Couchois, my high school choir teacher and show choir director in Piqua, Ohio, passed away yesterday. Couchois was there during the formative years of my life. He helped me to channel the music in my heart into the love and talent I have for musical theater today. He watched me struggle, sometimes causing those struggles, but always somehow knowing that what he was doing was the best for me. If he had actually ever given me those solos I always longed for, or those leading roles in the musicals, perhaps I wouldn't have worked as hard as I have and what I have today wouldn't mean so much to me. Maybe he didn't know, but I like to think he did. He was always encouraging me, never letting me give up. He helped me to feel capable and competent, yet made me work hard for everything I had. I remember him coming up to me in the hallway between the choir suite and the stage a few days before a show choir competition in Indiana and asking me to sing for their solo competition (to make up for the fact that I hadn't gotten one of the two lead roles in the musical). I sang. I won. I've gotten rid of almost all of my baton twirling trophies and gymnastics medals, but that big ole trophy from the solo competition? It still sits in my room, reminding me of everywhere I've been and everywhere I could be. Couchois also let me skip out on my study halls to sit in the soundproof rooms in the choir suite and listen to music while doing my homework or take a nap or practice or whatever it was I needed. He and I talked almost every day. He had been LDS at one point, and we would converse about the gospel often, even having a friendly rivalry between his church choir and ours...which lead to him showing up to church one Christmas Day to hear our choir sing. When I graduated, he gave me a lovely silver musical note necklace - one I have carried with me through it all. Upon hearing the news of his passing, I found myself thinking, "Now he finally knows how much he means in my life...and maybe now he can see my opening night!" Silly the things we think, isn't it? I couldn't read this blog post last year because of the tears & it was all still too painful & unreal to know he's gone. Now I read it thru my tears & know he's still here just no longer suffering or in pain. Thank you for sharing this! Saturday (4/21)is his 73rd birthday. I can't believe it's been a year already. Take Care! I love this man. And I cannot imagine the love you have for him. Thank you so much!